This is an amazing gourmet and culinary tour around Andalusia to immerse yourself in the mouth-watering flavours and aromas of Andalusia food and famed Sherry wines. We invite you to join us on a culinary tour that will delight you with great discoveries: the passionate universe of sherry visiting spectacular wineries some 269 years old, the fascinating kingdom of miniature dishes called Tapas in the very real region of its origin as well as its rich gastronomy, the secrets behind the production of the superb and unique in the world “Iberian cured ham” and the best olive virgin oil. The Mosque of Cordoba Moorish quarter is the most splendid monument of the Muslim period in the West. So visit Cordoba is a must, a city, which will also surprise us with its squares, its balconies overflowing with flowers, by the “Jewish” lovely white neighbourhood that is a testimony of the Jewish core already existed in Roman times. 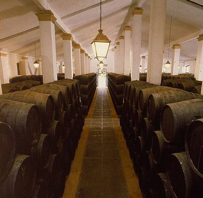 One day we will make an excursion to the land where the oldest Spanish wine “sherry” can only be made. In the year 1100 AD, a small Phoenician galley crossed the Mediterranean in search of new civilizations. After passing the limits of the known world they became shipwrecked not far from Jerez. The Phoenician merchants were captivated by the prosperity of this wonderful land and decided to establish a colony and planted vines, vines from which the famous classic sherry wines are produced today .Ever since Sir Francis Drake ransacked the port of Cádiz in 1587 and made off with 3,000 barrels of Jerez wine, many European countries have been addicted to it specially British who mistakenly pronounced it “Sherry”. And you will also savour fabulous Gourmet meals during the tour while staying in a small charming hotel situated in the historic centre of Seville that will permit you to explore and feel the cheerful atmosphere of this lovely city that will daze your senses. Arrive in Seville. – Transfer from arrival point in Seville to your charming and centric hotel. Some time for you to rest. Early departure to Jerez. Just one hour by train. Our Guide will be waiting for you at the train station (large groups will go by bus) to begin the visit at the Royal Andalusian School of Equestrian Art . A wonderful horses and antique cars with latch which also have the privilege to attend the exhibit ” How the Andalusian Horses Dance “, an equestrian ballet with distinctly Spanish music and costumes in the style of the eighteenth century museum, mounted on choreography learned from reprises of classical dressage and other works and traditional horsemanship. We will then be going to one of the best restaurants in Jerez to enjoy a meal consisting of excellent local dishes accompanied by fine sherry wines. In the afternoon we will visit a winery where we will be taken around what are spectacular buildings with their rows and rows of sherry butts stacked one on top of the other. These buildings are often compared to cathedrals and it is certainly true that they give the impression of being sanctified places. After a detailed tour including a complete explanation of the sherry-mak ing process, there will be a tutored tasting of the different styles of wine, including high end wines not normally tasted. After this tour, we hope that you will agree with most of the world’s top wine critics who believe that sherry is the most underrated fine wine in the world. Back to Seville, rest of the evening at leisure. Our guide will take you along the most important sites of this lovely city visiting the stunning Cathedral and the Alcazar, a monument of breathtaking beauty and has the additional merit of being the oldest preserved royal palace that is still in use in Spain and indeed in Europe. Morning free to explore this lovely city on your own. Second Hands-on cooking class with dinner. We will start the afternoon visiting a fresh food market. Learn about our variety of fresh products, from hundreds of fishes, to different Iberian hams, cheeses and olives, a pleasure to your sight. Today we continue with new recipes. It is the day for you to experience with new ingredients that have drawn your attention at restaurants during your tour. We will finish with a delicious lunch based on what we have prepared, accompanied with good wine or sangria if you urge to make. The Ave (TGV) will take you to Cordoba in just 45 minutes. (Groups by private bus ). The guide will lead you on foot through its squares, its balconies overflowing with flowers, by the “Jewish” lovely white neighborhood that is a testimony of the Jewish nucleus that already existed in Roman times … will visit the impressive Mosque, the most splendid monument of the Muslim period in the West. Lunch will be at a tavern where the Cordoba cuisine specialties are their star dishes. Free time to stroll, to wander through its white, narrow cobbled streets, shopping or having a coffee in a beautiful terrace. Optional: Farewell dinner at Gourmet restaurant with wonderful views of the River and the Torre del Oro. Last breakfast. Transfer to airport or train station. End of services. Culinary Spain wishes you a safe back trip home. 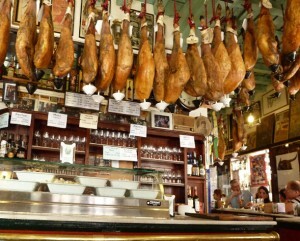 Private Cultural and tapas tour with English guide including tapas dinner with wine and other beverages . Private guided visit to the city including entrance to Cathedral and Alcazar. 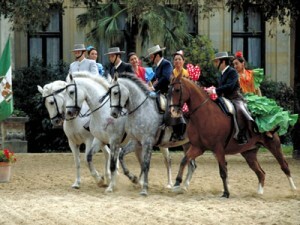 Private excursion to Jerez by train or minibus with English guide including meal with wine and entrances to winery with tasting, the museum, The Royal Andalusian School of Equestrian Art and the exhibit ” How the Andalusian Horses Dance. Private excursion to Cordoba by train or minibus including entrance to Mosque and meal with wine. 2 hands-on cooking classes at prestigious cooking school, including meals with wine. Menus will be not “a la carte” and will be fixed before hand by Culinary Spain. If there is any food you are allergic to or cannot eat, please inform us before your travel. 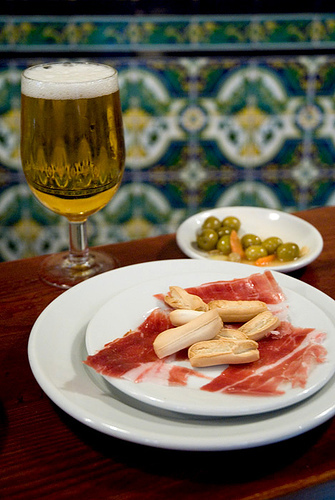 The order of days in itinerary or schedule of activities can be modified by Culinary Spain. The customer will receive the confirmed itinerary prior to travel. Please contact us to book, check prices and availability, or for further information: contact.